Oliver Giroud netted a double, Lukas Podolski scored and set up three more as rampant Arsenal closed the gap on the Champions League positions by thumping West Ham United 5-1 in their rearranged Premier League match on Wednesday. Arsenal, finding a spark and much-needed self belief after successive league defeats by title-chasing Manchester City and Chelsea, ran riot with four goals in 12 mad minutes after the break having fallen behind in the first half to Jack Collison's goal. Podolski, recalled after illness, quickly levelled with a superb strike from 25 metres. Giroud's volley made it 2-1 soon after the restart before German international Podolski, causing mayhem on the left flank, set up Santi Cazorla, Theo Walcott and Giroud to leave shellshocked West Ham 5-1 down before the hour. West Ham were forced to play with 10 men for the final 18 minutes after substitute Daniel Potts was carried off on a stretcher. Potts was treated for 12 minutes on the pitch before being taken to hospital suffering with concussion after clashing heads with Bacary Sagna. Arsenal stay sixth but are now one point behind Everton and four behind fourth-placed Tottenham Hotspur after 23 games. Manager Arsene Wenger said the performance was "a good response" from his players. "We played at a very high pace, great movement and quality in our final balls and in our combination play," Wenger said of the second-half deluge. "This team has a fantastic mentality. That's what we want to show until the end of the season now." Wenger praised Podolski's "outstanding" display, saying it was his most efficient in an Arsenal shirt. "He scored a very important goal -- an unbelievable shot," the Frenchman said. "He took responsibility when we needed him to. A player of his experience we expect him to do that." West Ham, the division's lowest scorers in the league away from home, surprised Arsenal on 18 minutes when a clearance from a corner fell to Collison and he took one touch and despatched a left-foot half-volley that flew past Wojciech Szcesny. Podolski levelled four minutes later with a low angled drive from 25 metres and the German was at the centre of a second-half goal blitz. Walcott's corner delivery to the near post was met by a stinging volley from Giroud that put Arsenal ahead before Podolski took over. 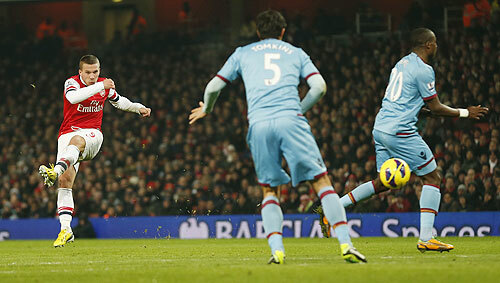 The floodgates well and truly opened when Santi Cazorla met Podolski's cross with a neat back-flick to make it 3-1. Podolski, tormenting the hapless Guy Demel, then picked out Walcott with a low cross for the fourth, then teed up Giroud for his second. The German, no doubt a little fatigued from his exploits on his comeback, left to a standing ovation when substituted with 20 minutes remaining. West Ham, with one league win in their last eight, remain 12th. West Ham manager Sam Allardyce described the start of the second half as a "horrible 12 minutes for us". "Sometimes you cannot live with the opposition when they are in top form," he told reporters. "We gave them the impetus to hit top form with poor defending straight after halftime."